Creativity is so alive in children. We begin to lose it as we get older not because we no longer have the abilities, but because we are more concerned about making a mistake, taking a risk, failing, and what others may think. In our society today, we do not encourage failing, mistakes, and certain forms of creativity. Most of us stay in our own realm of comfort. It is easier to maintain than to change. However, all of these items make it harder to be creative. 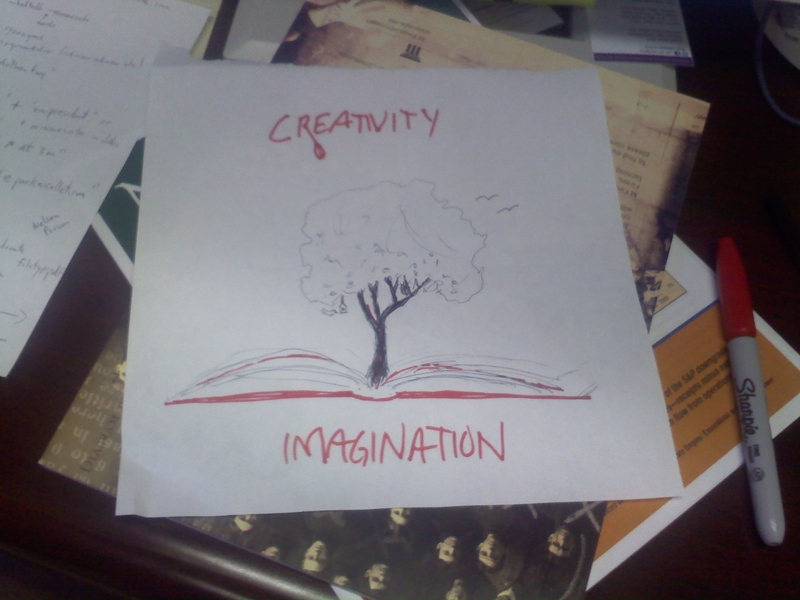 Think about creativity. You can imagine something specific, or you can visualize a whole life time. You can then turn it into a tangible, touchable, feasible reality. It is amazing. Pop culture examples include; 1.) Walt Disney- one man had an idea, now there are huge, dynamic, creative parks, movies, and media worldwide. 2.) the Harry Potter series – the author had an idea, the idea went to paper, then to more books, then to movies, now amusement park rides. 3.) Our founding fathers had a vision of a country free of tyranny and one that gave freedom and rights. It was a discussion, then a theory, then written, now a country. Anyone can be creative. One thought can build a cure, a building, a way to reach someone, a way to connect or help. We must be willing to surrender the ego, surrender worrying about failures and mistakes and just go for it and take action. There’s a link between creativity and positive emotions and, ultimately, happiness. Researchers have found that people are more likely to have a creative breakthrough if they were happy the day before. Creativity is less likely to be present with negative emotions such as fear, anger, sadness, and anxiety; it is positively associated with positive emotions such as joy, love, and curiosity. Positive emotions and creativity make us feel interested in the world around us. The ability to be fascinated and allow ourselves to explore and discover makes us feel open and alive. It’s also what draws us to learn new skills, perspectives, and ideas—resources that we can draw on to solve life’s problems. This boosts our resilience and our satisfaction with life—both part of the equation for overall happiness. Positivity, by Barbara L. Fredrickson, Ph. D. ..So I created a (WTLB) book, like a dictionary, which lists things like honesty, love, persistence, etc. with a definition that I created, with my wife’s input. I then turned it into a workbook with one word per page and space below for notes. For years we would discuss with my two daughters and they would draw pictures and make notes in the blank space. I may share some of those images with you. As they got older, they were less inclined to draw and more open to quotes and references from adults, hence where Frey Freyday came from..
BONUS- Ted Talk – the Source of Creativity – We want to be creative but channeling our creative impulses is no small feat. Is creativity something we are born with or can we learn it? In this hour, TED speakers examine the mystery of creativity.